Mikhail Piotrovsky, director of the Hermitage in St. Petersburg, has spoken out against the execution of an 82-year-old scholar of antiquities at the ancient complex in Palmyra by Islamic State militants. Mikhail Piotrovsky, general director of the State Hermitage Museum in St. Petersburg, has expressed condolences to relatives and friends of 82-year-old archeologist Khalid Asaad, the retired director of the ancient site of Palmyra in Syria, who was executed by militants of the terrorist organization Islamic State on Aug. 18. 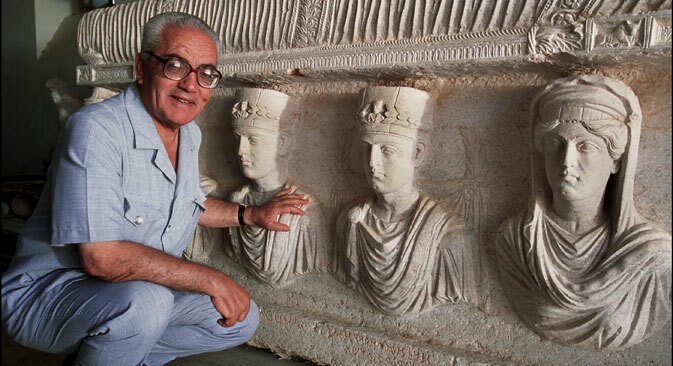 Asaad, the author of numerous scientific publications, worked in Palmyra, a UNESCO World Heritage Site, for more than 50 years. The scholar’s family members said that his beheaded body was tied to an ancient column on the central square of Palmyra. ISIS has been in control of Palmyra since May, when militants routed Syrian government forces in the area. “During its long history, Palmyra has seen many deaths, but this one – because of its senselessness and brutality – is one of the most horrific ... Before his death, Khalid Asaad was tortured for several weeks, and then executed ... We have no doubt that another terrible torture for the scholar was the reports of the destruction of many cultural sites in areas where ISIS is trying to settle,” Piotrovsky wrote in his blog on the museum’s website on Aug. 19. “What danger did Khalid Asaad present to the militants? What threat could an 82-year-old scholar, the author of numerous scholarly papers, pose to ISIS? It seems that the danger and threat to them was Khalid Asaad's work itself – the preservation, study and description of the ancient monuments of culture,” Piotrovsky wrote. “This is not the first time that the history of mankind has witnessed how radicals of any nationalities, any faith and ideology first destroy material cultural monuments – architectural monuments, sculptures, books – and then inevitably execute people – the guardians of civilization,” he continued.